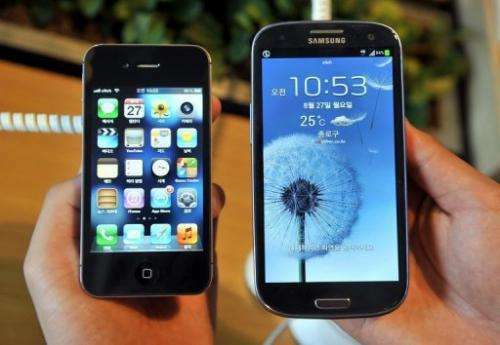 An employee shows an Apple iPhone 4s (L) and a Samsung Galaxy S3 (R) at a mobile phone shop in Seoul on August 27, 2012. Apple and Google extended their dominance in the US smartphone market as 2012 neared its close, industry tracker comScore said on Thursday. The most popular mobile phones were made by South Korean consumer electronics titan Samsung, whose handsets were used by 26.9 percent of US telecom service subscribers, according to comScore. Apple's coveted iPhones accounted for 18.5 percent of subscribers in the overall mobile phone market, up from 17.1 percent at the end of August.